So Tristan had chiropractic work on Friday, after much angsting on my part and carving room in the budget for it. He felt much more free through his neck on Sunday, so I was glad I did it. Then on Monday afternoon, the barn manager called. 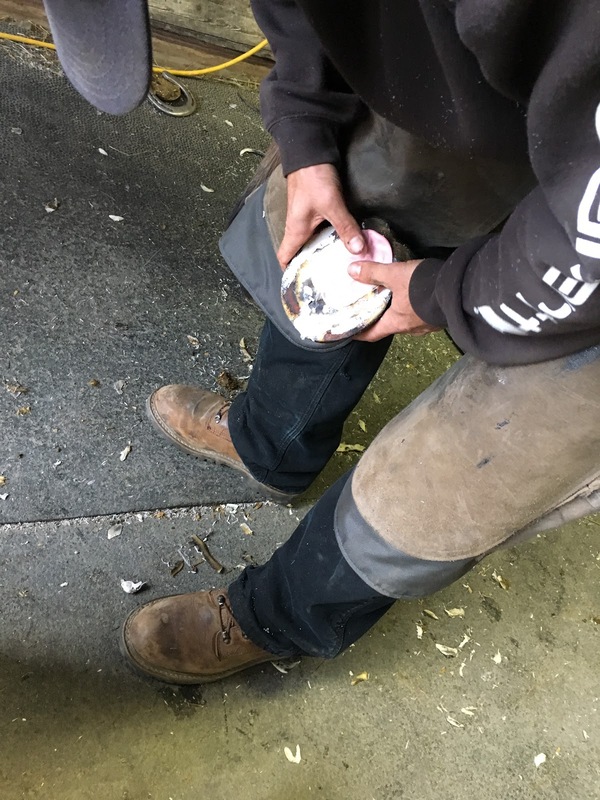 The farrier was there, and wanted to talk through Tristan’s right front foot. Yes, that right front. The problem child. It’s been over five years since it first started causing problems. If you’re new to that saga, start reading the abscess tag. Here’s the foot progression collage. Short version: he had a stress fracture of the coffin bone that separated, got infected, abscessed, and had surgery, and that foot has never been quite right since. It’s always grown slightly wonky, thanks to the scar tissue from the original injury and the abscess insult to the coronet band. 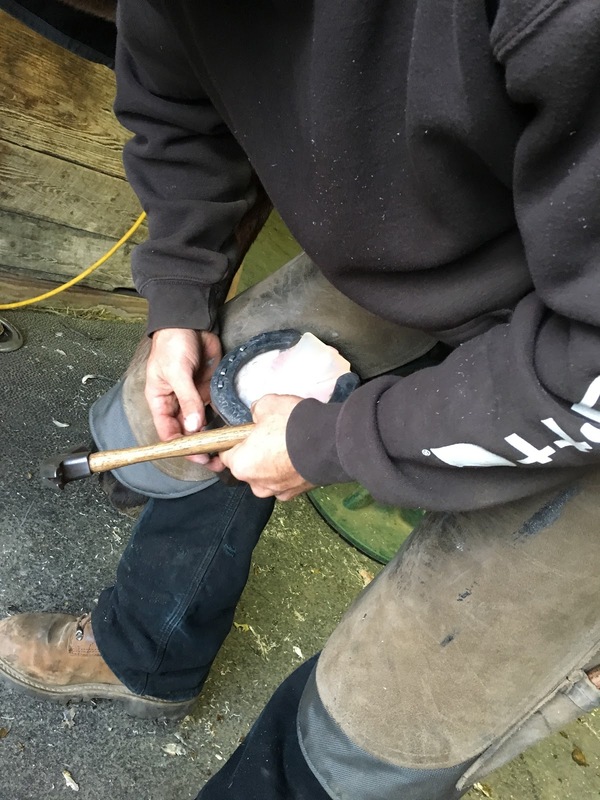 Well, the farrier was telling me over the phone that over the last few months it’s been resulting in a mechanical instability at the toe – not due to bad balance, but rather to the way the foot itself was growing. That had now resulted in some separation at the white line, a bacterial infection, and a growing crack. I knew the crack was there, and had already planned on talking it through with him, but I also thought it could be dug out with a normal trim. Joke’s on me, nothing about that foot is normal. 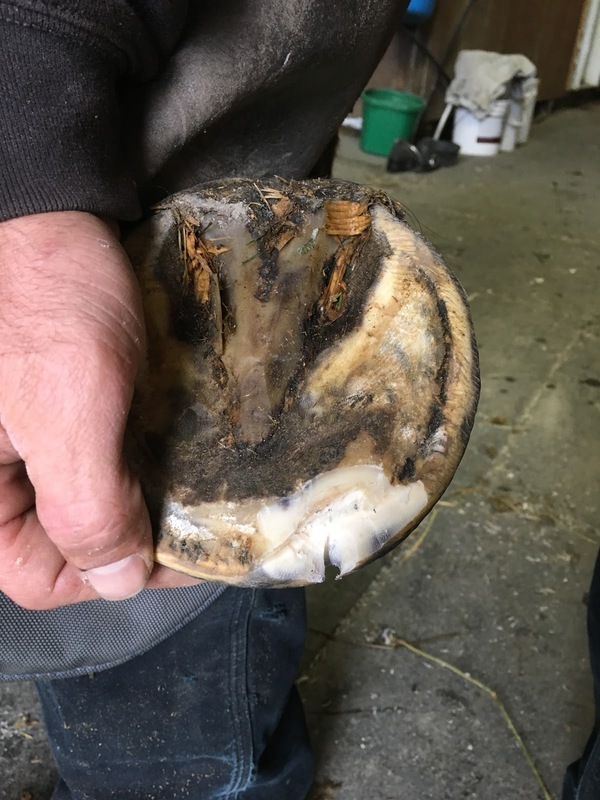 Verdict: he needed to get it totally dug out back to healthy foot, stuffed with artimud, and then…back in front shoes for stability and protection. Whooosh goes the money out the window. See, my budget is pretty tight, and it’s built around him being barefoot, which, 95% of the time, has been a realistic projection! Alas, not for the next few months. So here’s the foot all dug out. It’s tough to really tell, but that’s a decently deep hole. The good news there is that the farrier really thought it was better than his worst fears. 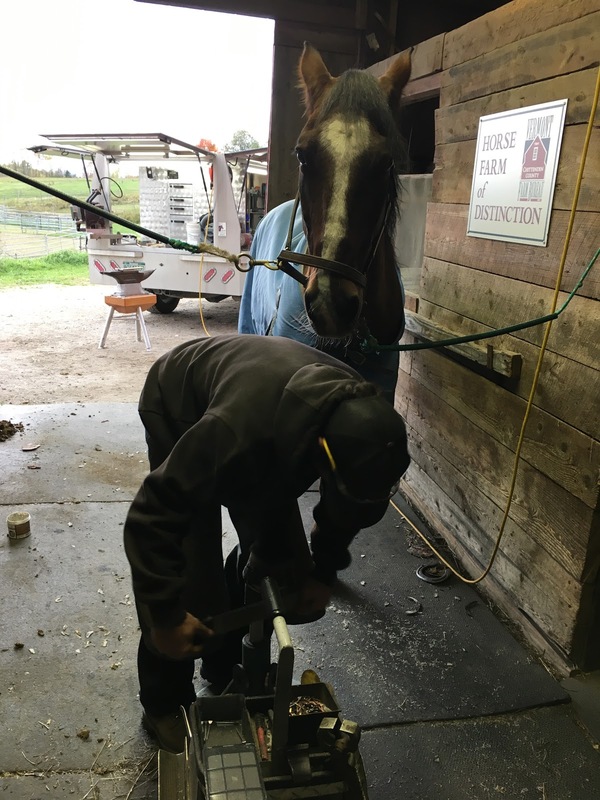 Tris also got hot shod for the first time, this farrier’s preference. 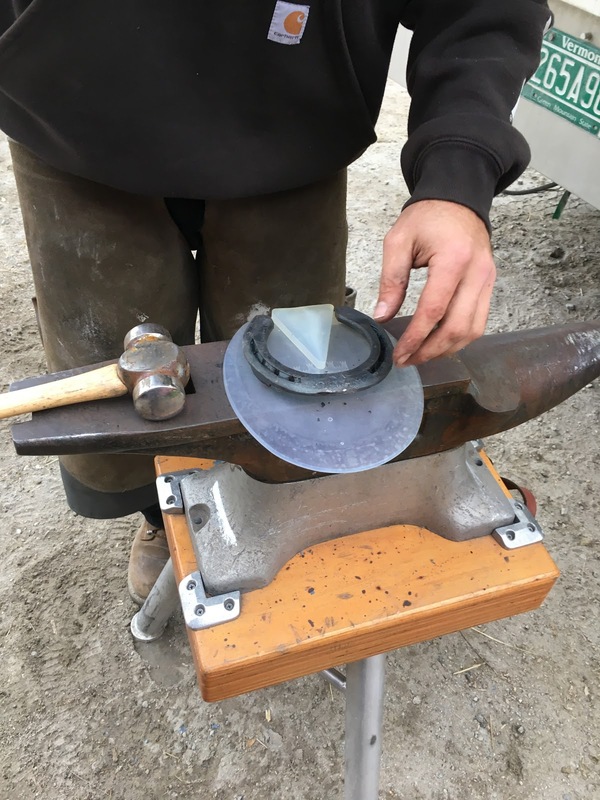 New farrier from the last farrier who did shoes on him – anyone remember when Tristan had to get sedated for shoeing? Yeah. Good times. Thankfully, I distracted him with peppermints and he did not put a foot wrong the entire time. GOOD PONY. Next step, artimud and dental putty. I was grumpy but resigned (also freezing cold, it was 40 degrees and I am not yet acclimated to winter) but then I got on…and we had our best ride in WEEKS. He was forward, he was cooperative, he was loose. Fine, pony. Fine. Have all the money. Glad he seems comfier now! Aw, bummer. That's great they made such a difference though. Hopefully shoes make all the difference in his comfort!! Yeah, horses have a way of spending our money whether we like it or not! 😦 Glad to hear there are improvements with the shoes though. Maybe his wonky hoof was causing other body issues as well, so it is good the farrier caught it! Seeing the difference from the change and money spent is the best thing ever though, so there's that at least?